As any artist, I am always on the hunt for new subject matter. New? How to keep zucchini new? Never boring? Yes, that is part of the hunt, the challenge and the ultimate success. Frequent guests know they will eat zucchini in one form or another during a summer meal. They are just never certain where the zucchini is. These fritters could keep some folks guessing. The zucchini is not evident in the crunch, the firm texture or in the bright garden flavor. Dip these fritters into your favorite homemade dressing and the thought of zucchini is totally lost. The original recipe comes from one of my favorite places to hang out: Food and Wine. Find the recipe here. Of course I’ve made tweaks, but the fritters definitely belong to those guys. Thank you so much! Indulge me while I soap-box on my bias. Over-grown summer squash belongs to the chickens or the compost. It is full of water and seed, devoid of the little flavor it had to begin with. 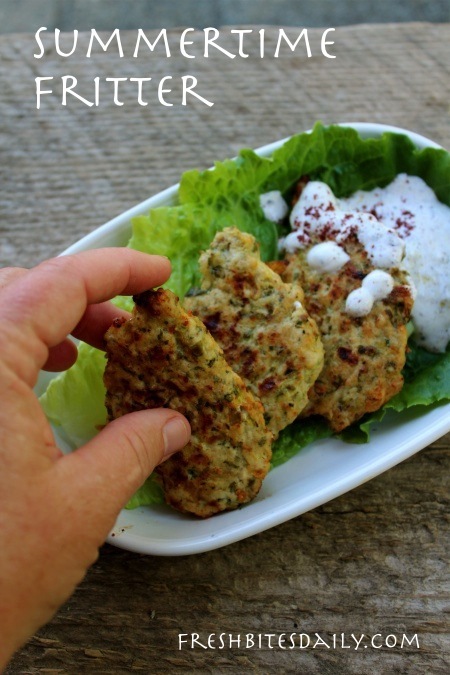 So, even when shredding zucchini for something like these fritters, use the young meaty ones. The skin is more tender. There is far less water and seed to contend with. Yes, the younger tender summer squash! Back to the fritters: We served these with sriracha for dipping, a large pan of roasted eggplant and tiny yellow crooknecks, and freshly picked garden tomatoes sprinkled with sea salt and sumac. Care to come to dinner? Summers are lovely! Mix the zucchini, garlic, onion, ricotta, eggs, dill, salt, and pepper in a medium sized bowl. When all the ingredients are well blended, gently mix in the flour. Heat a large heavy skillet containing about 1/8 inch of oil. When the oil begins to shimmer (watch closely), drop in tablespoons of the zucchini mixture. Flatten them with the spoon used for dropping. Fry the fritters for about three minutes before turning them over. The fritter should be browning. Fry on the second side for about three minutes, until brown and crisp. 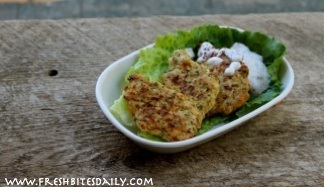 Place the fritters on a cookie sheet lined with paper towel. Keep the cookie sheet in a 200 degree oven until all the fritters are done. If necessary, the fritters may be re-crisped in a 325 degree oven.